Frederick Alfred Rhead was born in Newcastle-under-Lyme in 1856. He was the eldest of eleven children born to Fanny & George Woolliscroft Rhead. The Rhead family had been connected with the pottery industry since the eighteenth century. At the age of thirteen Frederick joined Minton’s as an apprentice painter and also attended evening classes at the Newcastle School of Art. In 1870 Frederick was assigned to the French ceramist and sculptor Louis Solon. Solon was considered to be the leading authority on the decorative technique of pate-sur-pate. Frederick worked for Solon until December 1877, by which time he had thoroughly mastered the pate-sur-pate technique which he used later in his career. Frederick married Adolphine Hurten, who was the daughter of C.F. Hurten from Cologne. Hurten was a superb naturalistic flower painter. In 1869 Hurten was persuaded to join W.T. Copeland after his work had been exhibited at the 1867 Paris Universal Exhibition and had been seen by Alderman Copeland, the head of the firm. Frederick and Adolphine had six children. Four of his children, Frederick Hurten, Harry, Charlotte and Adolphine all worked in the pottery industry. In 1878 Frederick along with his brother Louis joined Wedgwood’s. On leaving Wedgwood’s he joined the firm of James Gildea as Arts director. He then moved onto E.J.D. Bodley, again as Arts Director. Around 1894 Frederick moved to Brownfield’s as Arts Director. During his time at Brownfield’s, his two sons Frederick Hurten and Harry joined him when they left school and served their apprenticeship working under the guidance of their father. In 1896 Frederick joined Wileman & Co as Arts Director, both his sons moved with him. Within a short period of time he introduced several different earthenware ranges. Some included designs which he had learnt during his apprenticeship. The most popular range was Intarsio, others are Urbato, Pastello Spano-Lustra, Primitif and Faience. Another range that he designed was a style of ornaments which were known as ‘grotesques’. These were small pieces that were deliberately designed to look ugly and were mainly based on fantastic or mythical animals. He also started to improve the china range by introducing high quality enamelling to patterns on tea-ware. As Arts Director he would also have been involved in the introduction of the Dainty range that had just been designed by Rowland Morris. Around the turn of the century was a busy period for Frederick Snr. As well as carrying out his work as Arts Director, he took on a new process for the company. Frederick was approached by Harry Barnard, who had introduced tube-lining to the Potteries in 1895 when he set up an art pottery department for Macintyre’s of Burslem. Harry Barnard had previously worked for Doulton’s at Lambeth. Barnard only stayed for a short time at Macintyre’s before he moved to Wedgwood taking with him the tube-lining process. When Wedgwood’s decided to stop producing this range, Harry Barnard asked Frederick if he would take on the girls that he had trained to tube-line. So Wileman & Co took on the girls and started to produce a tube-lining range of ware. Four of Frederick’s children, Frederick Hurten, Harry, Charlotte (Lottie) and Adolphine (Dollie) were then taught how to tube-line, each of them used it later on in their careers, with Charlotte becoming best known for producing tube-lined ware. 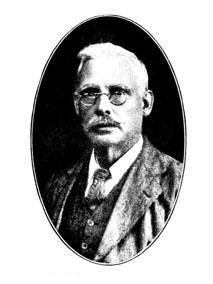 Frederick Snr. had a fascination with the Dutch people and after joining Wileman & Co, spent time in Holland sketching his subjects. On his return he turned his sketches into designs that were produced on ware, Wileman’s produced a nursery ware series depicting various Dutch children scenes with a rhyme. A Faience and two Intarsio vases and a teapot with a Dutch children scene are known to have been produced. Frederick Snr. 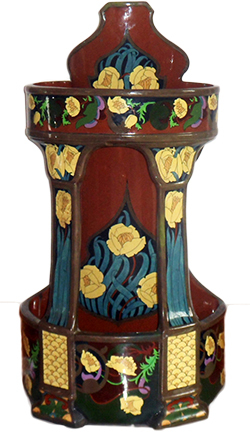 must have allowed his son Frederick Hurten to use some of his Dutch designs as he produced ware with Dutch scenes, when he was the Arts Director at Wardle & Co. Later on Charlotte also used one of her father’s Dutch designs to produce a tube-lined tile showing a Dutch girl with a hoop. In 1900 a large exhibition was held at Earls Court in London which ran from May until November. Wileman’s had taken a stand, mainly to sell the popular Intarsio range. Frederick’s wife Adolphine agreed to look after the stand during the week along with their daughter Charlotte and they both stayed close by at a relatives house in Kilburn. Frederick visited the exhibition at weekends to ensure that there was enough stock to meet the substantial sales that were taking place during the week. Frederick Alfred Rhead was only at Wileman’s until 1905 as Arts Director. But in those nine years he changed both the china and earthenware by improving the quality of the ware and introducing new ranges. This in turn started to build the reputation that the company became known for by producing top quality ware and designs that were wanted by the buying public. The reputation of the company was such that they were producing art ware for Liberty’s of Regent Street, London. After leaving Wileman, Frederick continued to work within the pottery industry. In1929 he started working for Cauldon Potteries as Arts Director. At this time Cauldon Potteries owned Royal Crown Derby, Royal Worcester and Ridgways (Bedford Works). It was at Ridgways where Frederick had his office. Whilst working for Cauldon’s he was taken seriously ill and died in 1933.